What is a Water Trash Pump? How to Use a Water Trash Pump? Arrange for an extension cord to plug in the water trash pump. It should be long enough to reach the pond or the basement. Plug it into ground-fault circuit interrupter outlet. Attach the drainage hose to the drainage port, which is usually located on the upper side of the water trash pumps. Lead the other end of the drainage pump where you want the all the dirty water to drain, maybe a nearby sewerage line. Attach the suction pump to the suction port and place it in the area from where the water or sludge has to be removed. The suction or inlet port is usually located at the bottom of the pump. Keep this as close to the water surface as possible for better performance. Turn on the pump and it will start pumping away the dirty water and draining it into the sewerage line. Keep an eye on the pump while it drains the water to make sure that inlet hose is not above the water level because the pump will stop sucking in the water then. Once all the dirty water is removed, you can turn off the pump and remove it. 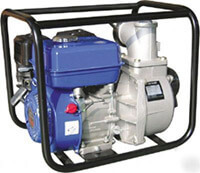 Water trash pumps are often used together with high pressure pumps for cleaning purposes. A pressure pump uses water to clean grime off many areas. Then a water trash pump is used to dewater that area. When used together they enhance each others capabilities and result is extra clean spaces. People often use water trash pumps to clean sludge off their ponds that they have made in their backyards. They are also excellent to empty swimming pools and are used indoors to clean any water that is collected inside the basement. At times when there are storms, water collects in the basement and that is where these pumps provide a handy way of emptying it. Water trash pumps are also used on construction sites to empty the water that rises often during the process of laying down the foundation. This is often the case when tall buildings need to have a very deep foundation to support their structure. These systems are great for extracting contaminated water and transferring it to recycling system. Every pressure washing business needs to comply with wastewater disposal laws.